It’s not often that a giant rock star gives an interview where he unflinchingly affirms his belief in Christ. That is exactly what U2’s Bono did during a March 2014 interview that is making the rounds again just in time for Easter. However, what is perhaps most interesting is how Bono appears to be well-versed in the writings of G.K. Chesterton and C.S. Lewis. Bono: I think it’s a defining question for Christian. Who was Christ? I don’t think you’re let off easily by saying a great thinker or great philosopher because, actually, he went around saying he was the Messiah. That’s why he was crucified. He was crucified because he said he was the Son of God. So, he either, in my view, was the Son of God — or he was nuts. Forget rock-and-roll messianic complexes. This is, like, I mean Charlie Manson-type delirium. And I find it hard to accept that all the millions and millions of lives, half the Earth, for 2,000 years have been touched, have felt their lives touched and inspired by some nutter. I don’t believe it. Byrne: So therefore it follows that you believe he was divine? Byrne: And therefore it follows that you believe that he rose physically from the dead? Bono: Yes. I have no problem with miracles. I’m living around them. I am one. Byrne: So when you pray, then you pray to Jesus? Byrne: And you believe he made promises that will come true. “If Christ was simply a human character, he really was a highly complex and contradictory human character. For he combined exactly the two things that lie at the two extremes of human variation. He was exactly what the man with a delusion never is; he was wise; he was a good judge. What he said was always unexpected; but it was always unexpectedly magnanimous and often unexpectedly moderate. Take a thing like the point of the parable of the tares and the wheat. It has the quality that united sanity and subtlety. It has not the simplicity of a madman. It has not even the simplicity of a fanatic. It might be uttered by a philosopher a hundred years old, at the end of a century of Utopias. Nothing could be less like this quality of seeing beyond and all round obvious things, than the condition of an egomaniac with the one sensitive spot in his brain. I really do not see how these two characters could be convincingly combined, except in the astonishing way in which the creed combines them.” — G.K. Chesterton. “Yet (and this is the strange, significant thing) even His enemies, when they read the Gospels, do not usually get the impression of silliness and conceit. Still less do unprejudiced readers. Christ says that He is “humble and meek” and we believe Him; not noticing that, if He were merely a man, humility and meekness are the very last characteristics we could attribute to some of His sayings. I am trying here to prevent anyone saying the really foolish thing that people often say about Him: ‘I’m ready to accept Jesus as a great moral teacher, but I don’t accept His claim to be God.’ That is the one thing we must not say. A man who was merely a man and said the sort of things Jesus said would not be a great moral teacher. He would either be a lunatic — on the level of a man who says he is a poached egg — or else he would be the Devil of Hell. You must make your choice. Either this man was, and is the Son of God: or else a madman or something worse. You can shut Him up for a fool, you can spit at Him and kill Him as a demon; or you can fall at His feet and call Him Lord and God. But let us not come with any patronizing nonsense about His being a great human teacher. He has not left that open to us. He did not intend to.” — C.S. Lewis. Chesterton and Lewis beautifully articulate the case before us: either Christ was who he said he was, or he was insane. But, as they both keenly observe, even his biggest detractors generally regard him as a profound thinker and a beacon of light whose example we should all follow. Think of how many great men and women there were throughout all history, whose names are forgotten within weeks, months, or at most a few decades after they’ve passed away. Then consider Jesus, who for over 2,000 years has captivated the world and changed billions of lives — even those who don’t believe his claims. Like G.K. Chesterton, C.S. Lewis, a modern Irish rock star named Bono, and billions of other individuals throughout the course of history, I firmly believe he was exactly who he claimed to be. Great post. So inspired to see someone today like Bono be so vocal about his faith, and with some substantial, thought-provoking wise words about it to boot. Reading Lewis and Chesterton was an amazing experience for me because on so many levels they articulated things that I always felt, but could never really put into words. I had all these nascent thoughts about my own faith swirling about in my head, and then reading their work helped many of them finally take shape. Great post Douglas. 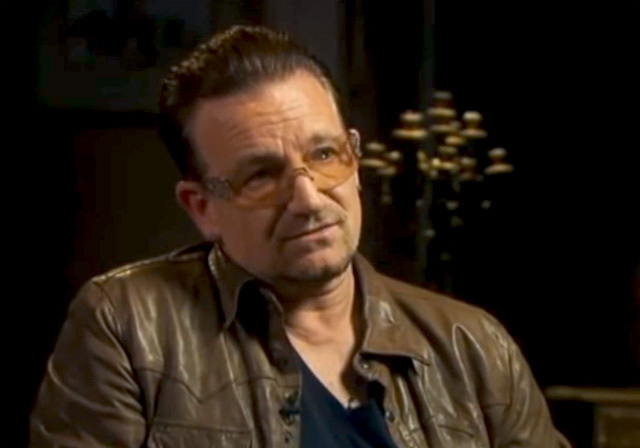 It’s encouraging to see men like Bono speak boldly for Christ. Did you read Everlasting Man? Orthodoxy is my favorite. P.S. the conversation with Anonymous is ongoing. You still have a conversation going with Mr. Anonymous? That’s some serious dedication! I hope you’ve made some headway, although if you haven’t then you can still honestly say you’ve given it your all on a spiritual level. That’s really all that counts, anyway.